It is that time of year again - BACK-TO-SCHOOL - but good thing The Happy Planner™ has a bunch of products to help everyone from students to teachers get more organized and have fun doing it. Enter today's super fun project by mambi Design Team member Jen Randall that she completed with her daughter, Madie. They both took some time to set up the 'Seize the Day' Student Edition Happy Planner™, and love the way it turned out! "As a mom & a former teacher, I know how important it is to stay organized as a student. My daughter starts middle school (what!?) in August and The Happy Planner™ Student Edition planners are a perfect way to stay on top of school business. She is a pretty social girl too and has plenty of activities to plan for. She choose the 'Seize the Day' Happy Planner™ and had such a fun time setting it up!" "The great thing about The Happy Planner™ system is that all kinds of different things can be added using the punches and folders. She was able to add schedules, calendars, a map of the school, notes, and adorable Planner Basics™. My daughter is looking forward to starting the year organized and ready to tackle all that middle school has to throw at her. 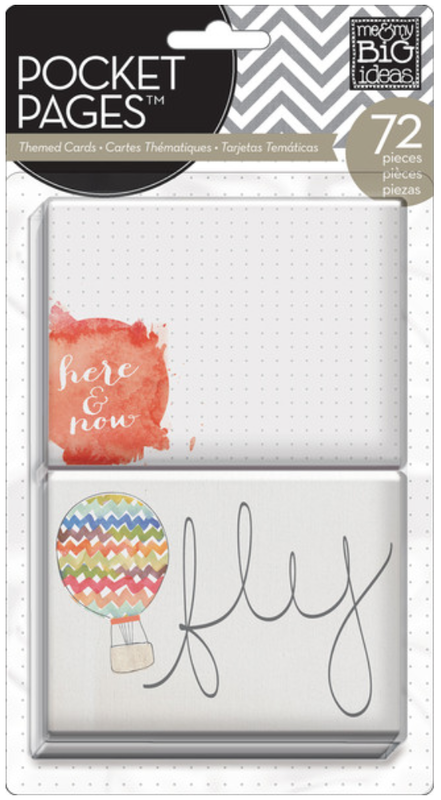 Not only is this planner functional, but look at how cute it is!" Shop supplies Jen and Madie used by clicking on the items below. With only a few days left until Thanksgiving, we know that those of you in college are doing your best to complete your assignments before the turkey hits the table. That's why today we're sharing these pages in mambi Deisgn Team member Heather Adams's Happy Planner™. Heather has organized her college ToDos in such a way that she will no doubt get it all done. Go, Heather, go! "At this time in the semester at college, there is SO much to do before finishing up for the year. I was feeling overwhelmed with things I needed to do, and the fact that I had to remember all the due dates was stressing me out. Then I remembered my Happy Planner™! I got out some of the blank notebook paper from the Note & Graph Paper pack and got to work listing out all of my end-of-the-semester ToDos. Writing everything out took such a load off my mind and now I'm happily crossing things off every day! I used a magnetic flag from the watercolor Happy Planner™ BOX KIT on the edge of the paper (I also added an extra page behind this list in case I thought of more stuff I needed to get off my mind). The motivational stickers on the page added the perfect inspirational touch. Here's to hoping I get lots of stuff done soon!" Today we're sharing a fun & easy way to document your child(ren)'s first day of school: right into your Happy Planner™. That's what mambi Design Team member Theresa Doan did with the August 24 - August 30 weekly spread in her Happy Planner™, and she even punched and added in a bonus pocket page! "I decided to add a 6x8 pocket page to this Happy Planner™ spread to include photos from the first day of school as well as a little journalling for each child. I used the blank grid side of some mambi POCKET PAGES™ cards and added stickers to embellish them as well as the photos." Whether tomorrow is the first day 'back to school' for your kids or they've been back to school for a couple of weeks now, these Lunchbox Notes by mambi Design Team member Jen Randall are the sweetest way to let your children know you're thinking about them. "I love putting little notes in their lunches throughout the week. I want them to know that I am thinking about them, We are now in FULL 'back to school' mode in my house, so I was inspired to make a bunch of Lunchbox Notes using all the fun mambi products! Last year I did the same project and my kids loved the handmade touch." "The process was very easy, fun, and straight forward. I got out a bunch of the me & my BIG ideas goodies and got busy creating. The super cute mambi products pumped with positive messages do a lot of the work for me. I know my kids will smile when they pop open their lunches and see these cards. I can stick them right into my POCKET PAGES™ album too! Perfect!" Happy Labor Day, all! Enjoy it & live creatively! In the past month, we've added a bunch of projects to our 'BACK to SCHOOL' gallery page. With this inexpensive craft, mambi Design Team member Jen Randall created a M-T-W-Th dry erase board for her daughter to keep track of 'back to school' events and assignments. "My daughter started 5th grade this year and there are many different things to remember for her homework each night. I wanted to give her a pretty, fun place to write down her nightly activities Monday through Thursday. When I was walking around the 99cent store, I spotted this white from for $1.99. Hello! Perfect. 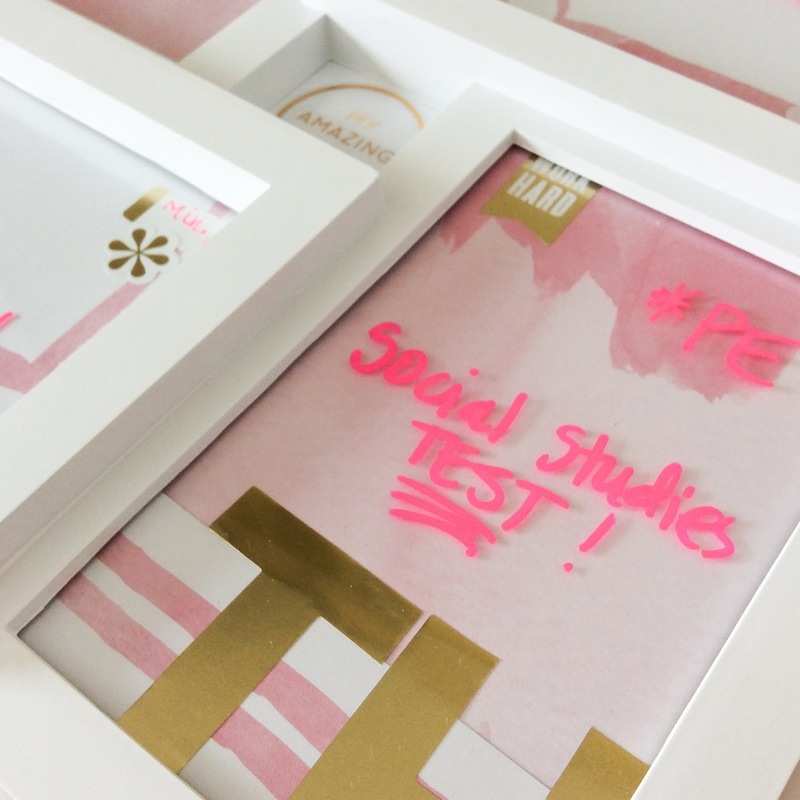 Along with some gorgeous pink paper and gold foil mambiSTICKS alphas, the combination was exactly what I needed." "The process of making this Homework Dry Erase Frame came together easily. I wanted to go with a pink & gold color combination which made choosing the paper & stickers a breeze. I love the size & font of the gold foil letters, although any of the awesome mambiSTICKS alpha stickers would work. There are so many to choose from! I wanted to add in some of the weekly regulars for my daughter, so I used some of the stickers from The Happy Planner™ line as well. I finished the project by adding a positive gold clear sticker to the center. The frame can hang on her wall above her desk (see mambi desk makeover HERE) or sit up on its own. MY daughter will love it!" Depending on where you live, school might have already started or you might have a couple of weeks to go. For mambi Design Team member Mary-Ann Maldonado's son, he has one week left of alarm-less Summer mornings before it's OFF TO 5TH GRADE he goes! To help him be ready for the change in routine, Mary-Ann worked together with her son on this Weekly Planner Pad page, plotting the back to school events happening next week. "Sometimes it is important to get your kids involved. 'BACK TO SCHOOL' is a time when it's necessary in our house -- as it is NOT a welcomed event around here. With a busy "kid" schedule rapidly approaching, I decided to use my Weekly Planner Pad to help my boy understand his responsibilities. Plus, it will help me get him where he needs to go on time. I asked him if he would like to help decorate my planner pad. He chose all the stickers and the color of the markers that were added here. He had the most fun choosing the washi we used from my wide collection. More activities will arise the first week of school so I had to leave some space for that. I know music will be added once we get the schedule." "After the wahsi tape, the first thing he wanted me to add was the bus sticker. (Even a kid going into 5th grade loves bright primary colors.) It was fun to do together, and will work better than his Minion calendar hang in his room with NOTHING written on it! Maybe together, we can mold him into a planner addict too! The pens I used for this project were the Paper Mate Flair pens. I get asked about them a lot, and I'm happy to report that they do not bleed or run. They are perfect and offer tons of colors!" One of the perks of being creative is that most ordinary things get customized, embellished, bedazzled, adorned, decorated, and personalized...made to be one-of-a-kind, and in turn, great conversation pieces. Today we're sharing this customized notebook cover by mambi Design Team member Heather Adams that will surely get noticed and complimented on during these first weeks back to school. "With the school season upon us, I thought it would be fun to decorate a notebook to use in my upcoming classes. I mixed little photo strips in with patterned paper to add a personal touch to my notebook. I love this time of year because I like doing just this -- buying cheap notebooks during back-to-school sales and decorating them!" Trim paper strips and photos (my strips were a little larger than 3/4 inches). Start on one side of the notebook and start adhering strips and photos to notebook. Continue until notebook is covered completely. Once finished, you may also seal the cover with mod lodge. Heather chose to omit this step, but did make sure she used a lot of glue to stick down those papers and photos so they won't come off in the future. See our other BACK TO SCHOOL projects HERE.